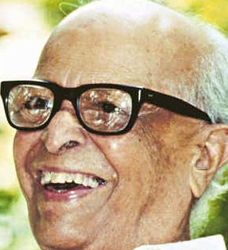 One of the most famous Indian writers in English Language, R.K Narayan was born in 1906 in Madras. He was educated in Mysore and settled there for over half a century. Narayan created the enchanting fictional world of Malgudi through his several novels and short stories which captivated his readers throughout the world and more recently millions of Indian Television viewers, who saw TV adaptations of many Malgudi stories. His famous works are ' Malgudi days' and ' Swamy and his Friends'. Narayan has a humorous way of presenting life around him. First Novel ' Swamy and Friends' (1935), and its successor, ' Bachelor of Art's (1937) are both set in the enchanting fictional territory of Malgudi. His books are regularly published in USA, UK and India and have also been widely translated into several European and Indian languages. His novel, ' the Guide' (1958) won him the National Prize of the Indian Literary Academy, the country’s highest Literary honour. He was awarded the A.C.Benson Medal in 1980 by the Royal Society of Literature, and in 1981. He was made an Honoray Member of the American Academy and Institutes of Arts and letters. He also received honorary doctorates from University of Leeds (1967), University of Mysore (1976) and Delhi University (1973) and Padmavibhushan in 2000. In addition to 6 collections of short stories- Malgudi Days, A horse and 2 goats, An Astrologer's Day and other stories, Lawley Road and other stories, Under the banyan tree and other stories and the Grandmothers tale and selected stories- he has published 2 travel books, 4 collection of essays, mythology and several novels. His biography 'R.K. Narayan, The Early Years' provides a splendid insight into the first four decades of his life. The famous cartoonist R.K.Laxman is his brother.